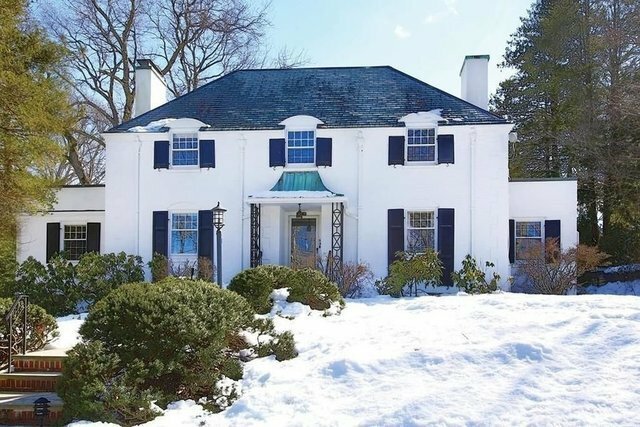 This beautiful ten-room center entrance brick Colonial with slate roof is located on a tree-lined street in Newton Highlands with easy access to Countryside Elementary School, the T, and Newton Highlands Village shops. It is an exceptionally appealing property with an open and inviting front foyer, large living room with fireplace, and a dining room with built-in corner cabinets. Adjacent to the living room is a wood-paneled den with fireplace and a spacious (second) master bedroom suite/in-law suite with walk-in closet and full bath. There is a convenient mudroom with direct access to the 2-car garage. The second floor features a master bedroom with bathroom and three generously sized additional bedrooms and another full bathroom. The lower level includes a family room with a fireplace, a laundry room, a storage room, and a large cedar closet. The property is sited on a very pretty 13,960 square foot lot.